Transformers Prime Beast Hunters Voyager scale armour up to take on Predacons. Lineup includes all new Predacon characters as well as new designs for Autobots and Deceptions inspired by the Transformers Prime Beast Hunters series. Figures include new action weapons and battle gear. Each sold separately. 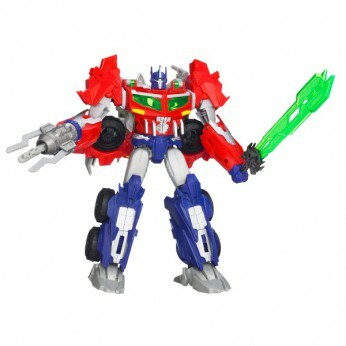 This toy costs approximately £22.99 (for the latest and best prices make sure you check our retailer list for the Transformers Beast Hunter Voyager Optimus Prime above). In our review of Transformers Beast Hunter Voyager Optimus Prime we classed it as being suitable for ages 6 years, 7 years, 8 years but recommend you check the manufacturer specific advice before purchasing.